So I usually don’t bother reviewing products because I usually go through them so fast or change because I can’t make up my mind if I like them. But this one has definitely been a winner, so I figured I’d share! 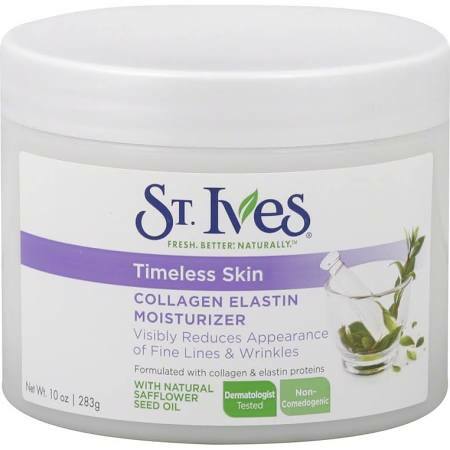 St. Ives Facial Moisturizer, Timeless Skin Collagen Elastin, 10 Fl Oz ” has made my face so soft and clear…I don’t even wear foundation anymore. And for me that’s a big deal, I’ve always had really sensitive skin and struggled with acne most of my life. But honestly since beginning a more regular regimen with this, my face feels great and my complexion is clear. And at only $5 a jar, it doesn’t break the bank either! Try it and let me know your thoughts.